Indore: In an award function held in New Delhi on Dec 29th, Pratibha Syntex Limited has won Jaivik India Award, for its farming initiative Vasudha Organic, in the category of Direct Farmer Linkage. 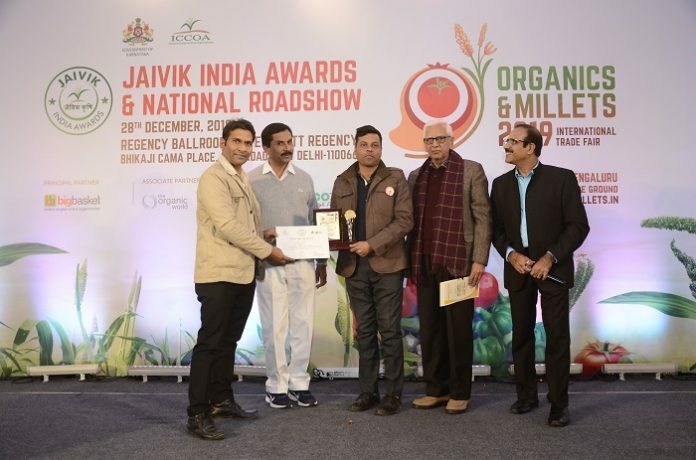 The award was given by ICCOA (International Competence Centre for Organic Agriculture), dedicated for a ‘knowledge and learning centre’ for all facets of organic agriculture, while working as an interface organization for the organic movement. Vasudha Organic aligns with Sustainable Development Goals (the SDGs), which are adopted by all United Nations Member States in 2015. SDGs provide a shared blueprint for peace and prosperity for people and the planet, now and into the future. While once farmers were totally dependent on market for farming inputs, Pratibha, through Vasudha Organic, attempted to turn the table. With its enormous efforts, today farmers are trained to produce organic farm inputs by themselves. The effort has impacted on farmers’ lives significantly, as this has reduced cost of cultivation by 40 percent, and dependence on market has also reduced substantially. Vasudha Organic has developed local input production centres in 5 Villages. These input production centres are producing various inputs like manure, biopesticides and tonics using locally available resources. These agri-inputs are provided to farmers at lowest possible cost. For revitalization of the global partnership for sustainable development, Vasudha collaborates with brands for different initiatives like Fair trade, Peace India, Textile Exchange, SAC, CottonConnect, C&A Foundation, BCI, India Organic etc.